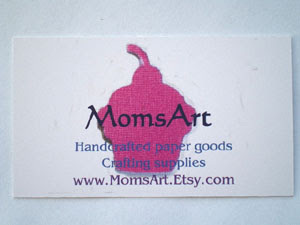 I LOVE your new business cards! terrific! I'm going to have to check iprint out, it sounds cool! Is it hard to set up the external harddrive, I need to save up for one because my stomach flip flops at the thought of losing all of my business data and pictures :( I definitly need to bump it up on my priority list for sure. With returning hunks, that's enough of a draw right there! I haven't connected the hard drive yet...better hurry up! It's supposedly plug & play and comes with a disk, so it probably will only take a few minutes. I've read TOO many beaders say their computers crashed and they lost everything! 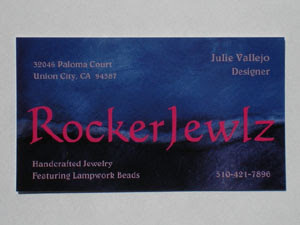 I love your new businesscard to! And also I love cupcakes! There is no store in stockholm for cupcakes. And we don't have any fun-jewelery, like the cupcake earrings and so on. Its a shame, because I would buy everything! Thank you for commenting on my Rockin' News blog. I don't have a cupcake shop nearby either which is probably good because they aren't cheap and I'd eat too many! I like that I can wear cupcake jewelry..you can too! 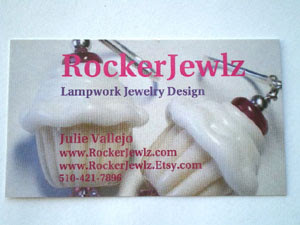 I ship internationally and you can find my jewelry at ww.RockerJewlz.Etsy.com. I'm glad you found my blog and commented...not everyone does so I never know if anyone is reading it unless I get comments.